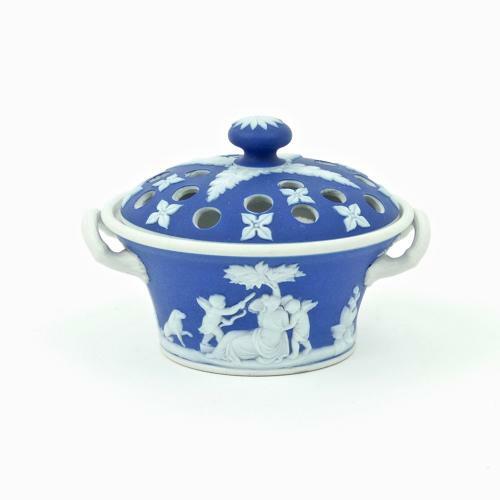 A rare, Wedgwood miniature violeteer. This piece is made from a dark blue, jasper dip pottery. It is marked 'WEDGWOOD', along with a small workman's mark, and it dates from c.1820. It is most unusual to find a piece of this form, in miniature, from this period, and it would have been made to display tiny flowers. The bowl is decorated with classical subjects and the pierced lid is decorated with leaves and flowers. All of the reliefs are very good quality, with fine detail, and the jasper dip is a rich shade of blue. Both the bowl and lid are in excellent condition. Price includes postage with the U.K. and Western Europe. Shipping to the U.S.A. add £10.